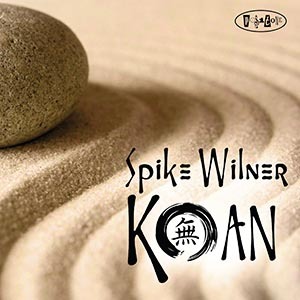 Pianist Spike Wilner brings a refreshing lack of pretention to his work on the trio recording Koan, with bassist Tyler Mitchell and drummer Anthony Pinciotti. There’s something so easygoing and unassuming in his playing and his compositions that you can’t help but like the man, and the jaunty opener, his original composition “Iceberg Slim,” captures you right at the start. The title track poses thornier questions, which Wilner and his mates answer with a swinging rhythm, quotes from Fats Waller (Wilner stride background peeks out here and there throughout the album), and the pianist’s clean, percussive, rippling right hand. That right hand is the main star of these proceedings, but it’s his left that keeps his “Trick Baby” rolling with its echoes of stride and that shapes his lines in Noel Coward’s “I’ll See You Again.” The selections include a hymnlike rendition of Ellington’s “Warm Valley” and a dancing version of the Duke’s “Gypsy without a Song,” and the trio swings on Tadd Dameron’s finger-breaker “Hot House.” Wilner’s harmonically unsettled “Monkey Mind,” with some very nice counterpoint, explores edgier neighborhoods after a dreamy opening, and his dark, searching, gnarly “Three Ring Circus” is perfectly balanced by the trio’s whimsical take on Johnny Richards’ “Young at Heart.” Ornette Coleman’s “Lonely Woman” begins with mystery and moves through compassion and celebration before retiring once again to contemplate the mystery. Wilner’s anthemic “Blues for the Common Man” closes the proceedings with a determined optimism, with each chorus finding a fresh expression of fellow feeling.